The London skyline is recognised the world over, and its streets of architecture spanning centuries offers a wealth of opportunity for productions of all kinds. Filming the iconic buildings and views that make London so distinctive from a public street is free, but you need to be sure you have the correct permissions. And we are here to help! 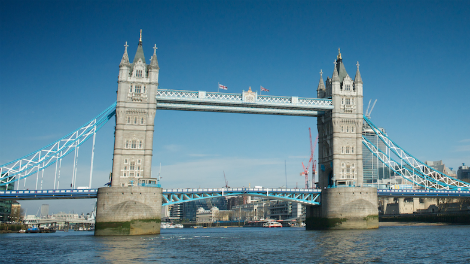 Because of the way that London is divided into different councils, the angle from which you film an iconic building or place will affect which local authority you will need to contact for permissions. Many locations that allow for public access are privately owned or managed. The camera position maps below provide contact details for both local authority and privately managed locations. Please be aware, you will need a permit for any privately managed location and a filming fee will likely be charged. Several different bodies manage permissions for filming in and around Big Ben and the Houses of Parliament. The position from which you want to film will affect who you need to ask. Filming at this royal residence is heavily controlled. Generally commercials or filming relating to specific brands will not be considered. Please give as much notice as possible when applying to film (a minimum of 5 working days will usually be required). A location fee will be charged in most cases. The Royal Parks should also be contacted for permission to film the Changing of the Guard. Permission to film inside Buckingham Palace is rarely granted. The Palace press office can be contacted on +44 (0)20 7839 1377. Two different bodies manage filming at Canary Wharf. Two different bodies manage filming at Covent Garden. Although it is open to filming, the square is always busy and is particularly crowded in the evenings and at weekends. Applications to film in Leicester Square should be made to the Special Events & Filming Team in the City of Westminster. Email SpecialEventsEP@westminster.gov.uk or call 020 7641 2390. Most of the square is in the borough of Camden, but the south quarter is in the City of Westminster. Download the floorplan for borough boundaries, the location of the pay and display meters, ticket machines and other parking bays. The boundary line for boroughs on either side of The Thames runs through the middle of the river – splitting authority over London's bridges in two. For filming purposes the majority of boroughs have agreed that one will take responsibility for an entire bridge. Some of the bridges are Red Routes so you may also need to contact Transport for London. Each type of transport ­– London Underground, Transport for London, River Services, London's City Airport, Network Rail, Eurostar and Docklands Light Railway (DLR) – has its own filming contact and welcomes requests to film. Filming is usually only permitted outside museum opening hours (10am-6pm). Three bodies are responsible for filming on and around the Greenwich Peninsula. Comprising of the Olympic Stadium, AM Orbit, Lee Valley Velo Park and much more, there are multiple contacts to arrange filming at the Queen Elizabeth Olympic Park. There are two key organisations that hold responsibility for the length of the river. The Port of London Authority (PoLA) presides over 95 miles of the Thames, from Teddington Lock to the sea. Any filming on this part of the river must have their approval and licence. The Environment Agency manages the non-tidal Thames, from the Cotswolds to Teddington. It is also responsible for the Thames Barrier. Contact Steve East on 020 8305 4132 or email steve.east@environment-agency.gov.uk with your enquiries. The Royal Parks are Hyde Park, The Green Park, St James's Park, The Regent's Park, Greenwich Park, Bushy Park, Richmond Park and Kensington Gardens. In addition, The Royal Parks cares for Brompton Cemetery, Victoria Tower Gardens and Grosvenor Square Gardens. The Royal Parks actively supports and encourages filming but may not grant permission to projects that it deems socially irresponsible or disrespectful. See a full set of Filming and Photography Guidelines for the Royal Parks, with full details of the filming policy, application procedure and filming contacts. South Bank and Bankside area stretches over two square miles along the southern bank of the River Thames. The area sits within the boroughs of both Lambeth and Southwark, but many parts of South Bank are divided up by the private organisations and agencies that own and manage the land. To film along the whole of the river bank you may need to seek permission from more than one organisation – depending on where you place your camera. Filming is allowed at the Tower of London, subject to the size, scale, and appropriate nature of the production and subject to individual negotiation. As a World Heritage Site and the most visited historic attraction in the UK, filming is subject to strict guidelines. There are a number of locations from where you can film the exterior o the Tower of London, managed by different parties. Download the map to find out what views you can get and who to contact for filming permission. The square has a busy calendar of events and political gatherings but is also available for filming. Westminster City Council for the surrounding areas including the north terrace. Contact the Special Events & Filming Team on 020 7641 2390 or email filming@westminster.gov.uk with enquiries. The National Gallery is responsible for the paved passageway between the main building and the Sainsbury's Wing of Gallery. For any enquiries about this area please contact the venue hire team on 020 7747 5931 or email venuehire@ng-london.org.uk.